Today is National Go Fishing Day, a day (like any other) to pretend that fish aren’t sentient beings who feel pain, possess innate intelligence, express social behavior, have memories…and who, like us, just want to live their lives. 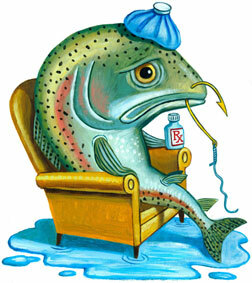 Instead, our species is encouraged by a multi-billion dollar recreational fishing industry to trick them with bait, “play” them on the end of the line, “fight” them on fly rods, and congratulate our skillful selves as victors when we haul them, gasping and suffering, out of the only universe they know. We perpetuate this cruelty by teaching children to disregard their suffering–they are, after all, only fish and objects of “sport”—in numerous summer fishing camps designed to produce enthusiastic little anglers. But here’s the rub: The monied interests are organized. Trout Unlimited is in the classroom and offers a First Cast program–a “new nationwide initiative to introduce youth to coldwater conservation through angling.” (TU is only one organization–there are many; here’s another.) In a country that celebrates a National Go Fishing Day and conflates conservation with injuring or killing sentient beings for sport, how do we reach the more than 10 million kids who go fishing (2013 statistic) with a message about empathy for fish? Animal activists are swimming against a powerful current, for sure–but this only makes us stronger for the long haul. fabulous…needs to be addressed! thank you again, Kathleen!